Earlier this week, also the subject of my previous blog post, I made an easy Strawberry Mousse that I was directed to via Pinterest. I had quite a bit left and started turning my thoughts to ways I could use the remainder and wondered if there was a way I could use it for my contribution to a housewarming we were invited to yesterday. The first thought of using this mousse as our contribution came when I was talking about the school bake sale and one of the hosts for last night’s event said I should bring the mousse because it sounded great. However, I didn’t want to make something for an adult evening that I would make for a kids’ bake sale so I decided to figure out a way to make it more suited for a celebration. 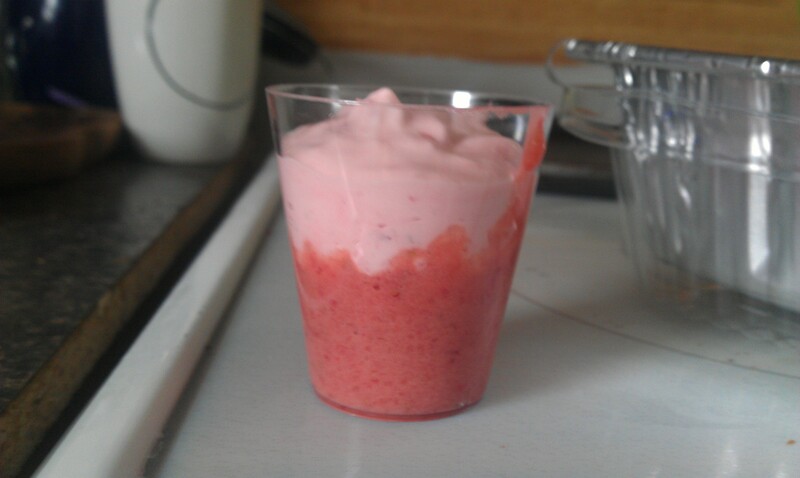 Thus yesterday in my kitchen Strawberry Mousse Dessert Shots with Drunken Strawberry Puree was created. The really great thing about this recipe is that you can hold back the alcohol when making the puree and this instantly becomes a family friendly item. Ingredients: Double batch prepared strawberry mousse, Bailey’s Irish Cream, and 2 cups pureed fresh strawberries. When I originally conceived of the idea for this dessert shot I was going to use coconut rum and put the alcohol in the mousse itself. While discussing the logistics with Kevin he pointed out that the addition of the alcohol could thin the mousse out and cause it to loose the texture that would be expected with the term mousse. 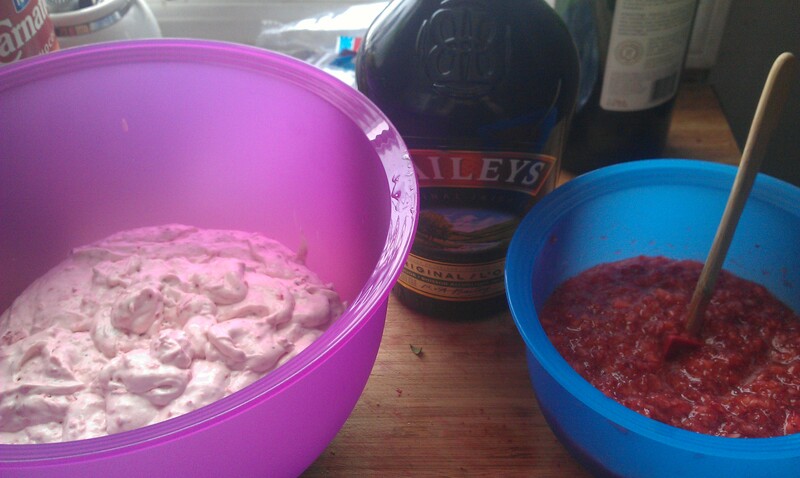 So I turned my attention to my strawberry puree and Kevin told me to feel free to use a bit of his Bailey’s Irish Cream. So to my two cups of pureed fresh strawberries I added 2 teaspoons of white sugar to enhance their sweetness and 10 tablespoons of Irish Cream to achieve my drunken status. Kevin suggested that we run the puree through the blender after adding the Bailey’s to ensure that the mixture was smooth and he wasn’t wrong. After being run through the blender it was a great consistency. Using the same 2 ounce plastic shot glasses from my Jell-O Magic Mousse I put 1 tablespoon of the puree into the bottom of each cup. Then taking my Tupperware decorator and filling it with my strawberry mousse I put enough mousse on top of the puree to cover it completely and when I looked from the side I had good visible layers. I got 30 of these in total. If I had gone with 1 ounce shot glasses I may have been able to double them but in the end I had enough. After piping I took advantage of Kevin’s suggestion to put them in the deep freeze for the hour before we had to leave so that they would stay firm and cold even though we had other things to do prior to getting to the party and another fridge to keep them in. This was a great idea and my dessert shots set up every well and transported even better. One got knocked in transit and it didn’t run out from the cup as it was nice and firm. I got many compliments on the shots. I was mostly proud of the fact that I managed to jazz up some leftovers in a way folks completely enjoyed. Concept and presentation were mine. Clean and hull 1.5lbs of fresh strawberries. I put them through the mini chopper to get them nice and small. In the end I had 2 – ish cups of puree. 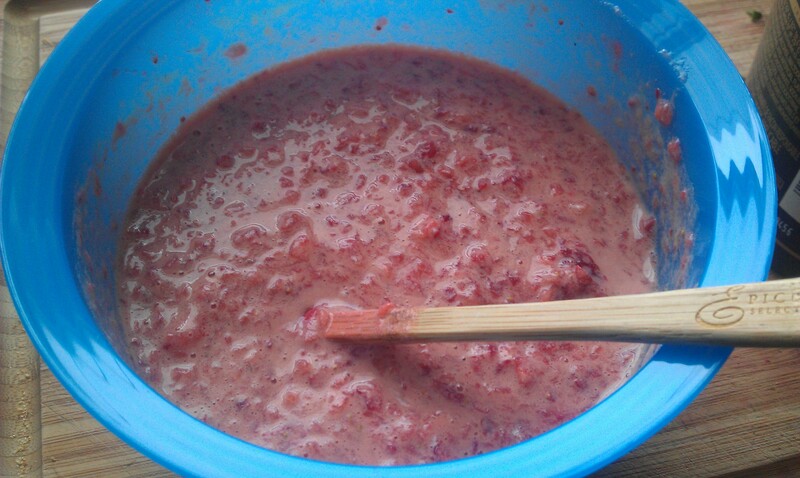 Add two teaspoons of sugar to the strawberries and stir until well combined. You can adjust this to your preference and to the sweetness of the berries you started with. Add 10 tablespoons of Bailey’s Irish Cream. Stir to combine. Take the puree mixture and run it through the blender until smooth. This is will thicken the puree up a bit as well. Using 2 ounce plastic shot glasses, place 1 tablespoon of puree in the bottom of the glass. Pipe strawberry mousse until you have a nice layer on top of the puree. Posted on March 3, 2013 by Shirley Robert	• This entry was posted in For The Adults, Recipes and tagged adults, bailey s irish cream, Bailey's, celebration, dessert, dessert shots, double batch, food, fresh strawberries, housewarming, Irish Cream, layers, mousse, puree, strawberries, strawberry mousse dessert, strawberry puree. Bookmark the permalink.